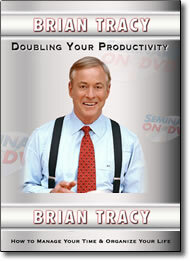 Doubling Your Productivity DVD by Brian Tracy – Free Preview – Save! In this powerful session by Brian Tracy, you’ll learn how to organize every area of your life. You’ll discover the best ways to eliminate time wasters, new strategies for using your time in an extraordinary manner, how to increase your personal power, how to make yourself more valuable, and what the keys are for staying motivated. Learn keys to improving your efficiency that you can begin to implement right away. This session promises to not only bring your productivity to a new level, it will propel you in the direction of your most important goals & dreams! You’ll learn to achieve more and stress less. Brian Tracy is one of the most in-demand speakers in the world on the subjects of business productivity and personal performance. He’s a dynamic and entertaining presenter, teaching important strategies and motivating ideas on how to reach higher levels of achievement, income and happiness.